I've always wanted a vintage sectional but they're hard to come by and expensive to reupholster. Nonetheless, I kept searching. Just when I thought my dreams of owning an awesome sectional (for a reasonable price) were gone, I finally got one this weekend for just $500! While it's not a full sectional, it's close enough in my book! To complete my dream, I'm building a corner piece that will connect the two sofas and give me the retro sectional I've always wanted! As great as the original coral Naugahyde covers are, I'm recovering the couches in fabric so they're comfy for movie nights. We tried Joann Fabrics but they're a little pricey for the amount of fabric we need and the selection isn't that great. We also stopped by Vogue Fabrics over by the UIC campus. 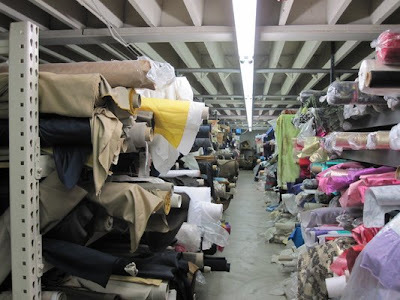 They have super affordable fabrics and a good selection, especially for clothing. Unfortunately we just couldn't find the right upholstery fabric to go with our color scheme. Our next stop is Textile Discount Warehouse which is apparently THE place to go in Chicago and is literally a warehouse of amazingly discounted fabric. I CAN'T WAIT TO GO!!!!! Just look at all the fabric. Aside from the couches, I also got two vintage chairs from the same seller for just $10. They're in horrible shape right now but they'll look great once I'm finished fixing them up. Keep a lookout, they'll probably end up in the Apt528 Store's soon to come furniture section! Oh my - LOVE your sofas! I too have always wanted mid century sofas but can't seem to find a matching pair that I can afford. Cool chairs too!